The Linksys WRT32X AC3200 Dual-Band Wi-Fi Gaming Router with Killer Prioritization Engine uses the Killer™ Prioritization Engine to provide the best home routing solution for serious online gaming. It is built with an enterprise-grade hardware to deliver the fastest wired and wireless speeds for your network. 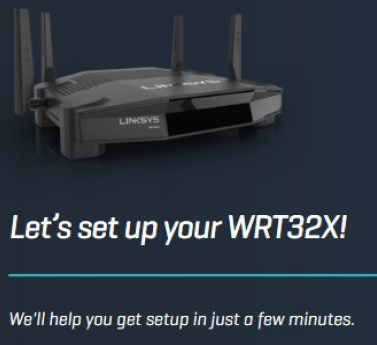 This article will guide you on how to set up the Linksys WRT32X using a computer, tablet or smartphone. Make sure the internet connection from your internet service provider (ISP) is working. If you are replacing your existing router, make sure to disconnect it and move it out of the way. 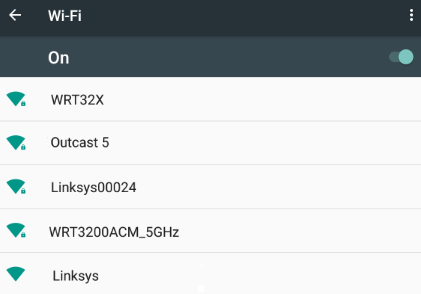 Have your new router's default Wi-Fi settings ready. The default Wi-Fi name and Wi-Fi password of the router are located at the bottom of the router. 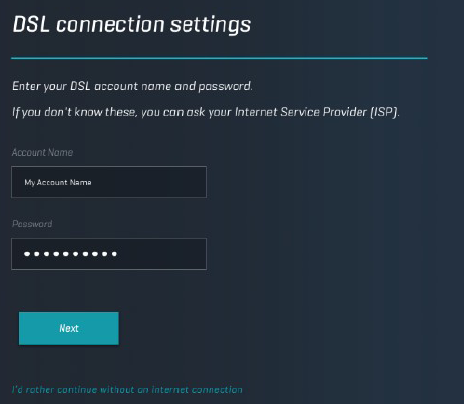 If you have a DSL connection, have your DSL username and password ready. Identify and prepare your equipment for setup. Modem only: If you have a separate modem and standalone router, disconnect and remove your old router. Powercycle your modem. Modem router: If you have an all-in-one modem router, leave it connected. Connect the antennas to your router while it is turned OFF. Connect an ethernet cable to the internet port of the router. Connect the other end of the ethernet cable to the modem. Power ON the router and wait until the power light is solid. To learn about the light behavior of your router, click here. 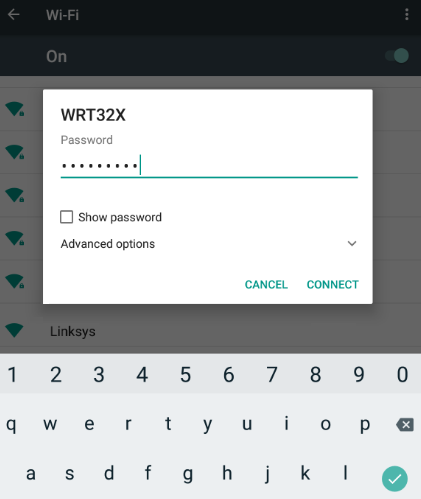 If you are using a mobile device, connect to the default Wi-Fi of the router (LinksysXXXXX, where XXXXX indicates the last five digits of the router's serial number). Enter the default Wi-Fi password that is located on the label underneath the router. NOTE: If you are using a computer that is hardwired, connect an ethernet cable to a numbered port on the router and connect the other end of the cable to the computer. Open a web browser and enter “http://myrouter.local” or "192.168.1.1" in the Address bar and then press or tap Enter. You should now see the welcome screen of the setup wizard. Click or tap Next to begin the setup wizard. NOTE: Click or tap skip setup to manually configure the router. For instructions, click here. 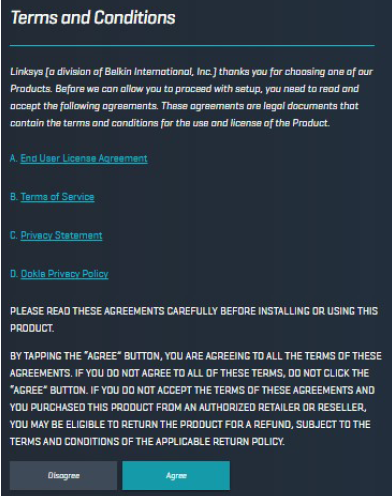 Read the Terms and Conditions and scroll down to click or tap Agree. Scroll down to click or tap Next. The wizard will verify your internet connection. If a DSL connection is detected, you will be prompted for your DSL credentials. Enter your DSL credentials then click or tap Next. NOTE: If at any time the wizard fails to detect a connection and following the troubleshooting steps provided does not resolve the issue, click or tap on I’d rather continue without an internet connection to complete the wizard without an internet connection. 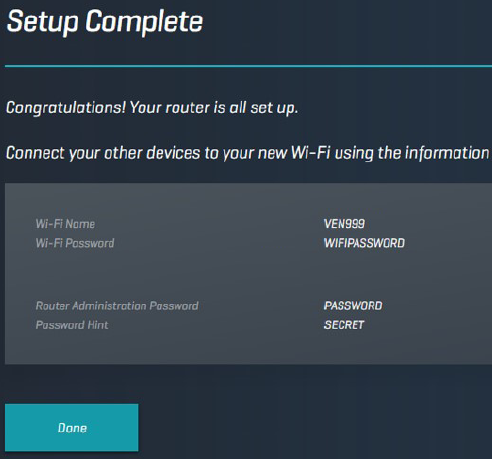 After setup, you can log in to the router and manually configure your internet connection. For instructions, click here. The wizard will check for any updates available for the router. Click or tap Next. Create your own Wi-Fi Name and Password. NOTE: By default, the 2.4 GHz and 5 GHz bands share the same Wi-Fi name and password. If you want to customize each band, click or tap Give my Wi-Fi bands different names. 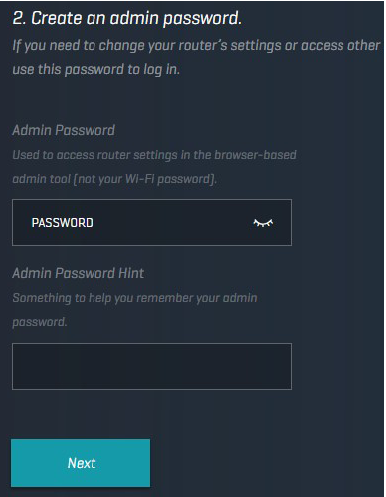 Create your own router Admin Password and an optional Admin Password Hint. Click or tap Next. 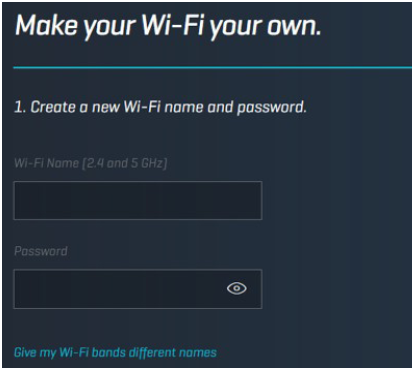 Connect to your new Wi-Fi name on your computer or mobile device and then click or tap Next on the wizard. 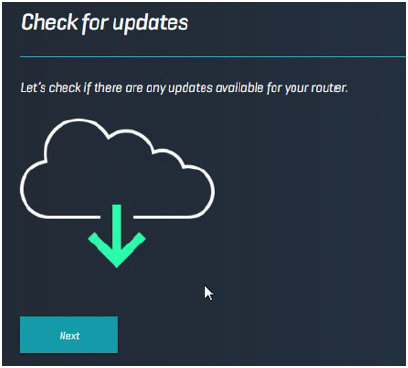 NOTE: If you are using a computer wired into the router, just click or tap Next. If you are using a wireless device, the Next button will become available once your device has connected to the new Wi-Fi name. 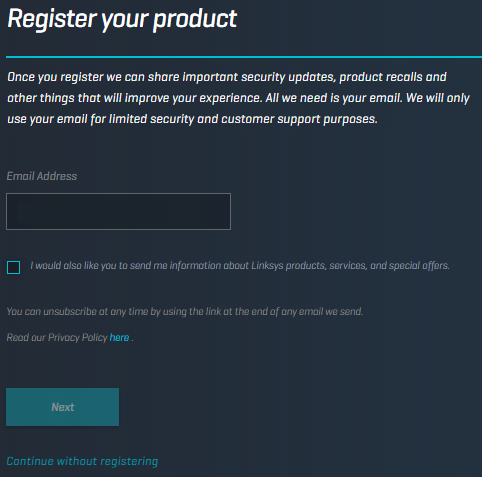 Enter your Email Address to register the router. Click or tap Next. NOTE: You can also click or tap on Continue without registering to register your product later. Click or tap Done to close the screen. You have now successfully set up your Linksys WRT32X.